It’s not for nothing that the cliche “a picture worth a thousand words” was invented. 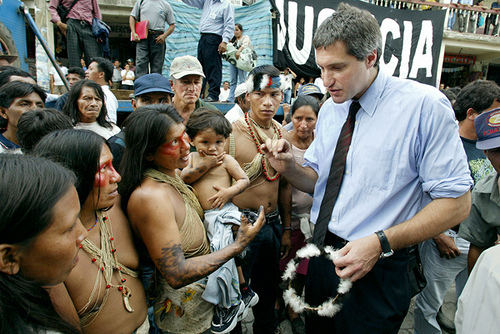 I came across such a picture in an unlikely venue this week: the current issue of The New Yorker, in a long article by Patrick Radden Keefe on attorney Steven Donziger’s efforts to represent the indigenous peoples of Ecuador whose lands have been been ruined by the toxic oil extraction practices of Texaco/Chevron. What fascinates me about this image is the huge differences evident between the indigenous people with their face paint and beads, and the oversized white American lawyer, with his conservative haircut and business attire with watch and tie. And yet despite the differences in culture and background, these people are on the same side. The fact that I found this picture in The New Yorker speaks volumes about the success of Steven Donziger’s heroic crusade to bring justice to bear on the oil barons who have desecrated the rainforests of Ecuador. The New Yorker has been known upon occasion to publish some anti-establishment material–think Elizabeth Kolbert‘s hard-hitting series on climate change, or Seymour Hersh‘s series blowing the lid on Abu Ghraib. But by and large, the magazine doesn’t do much to challenge its cultured, white, upper-class New York readership. But this is exactly what Keefe’s article on Donziger manages to do. 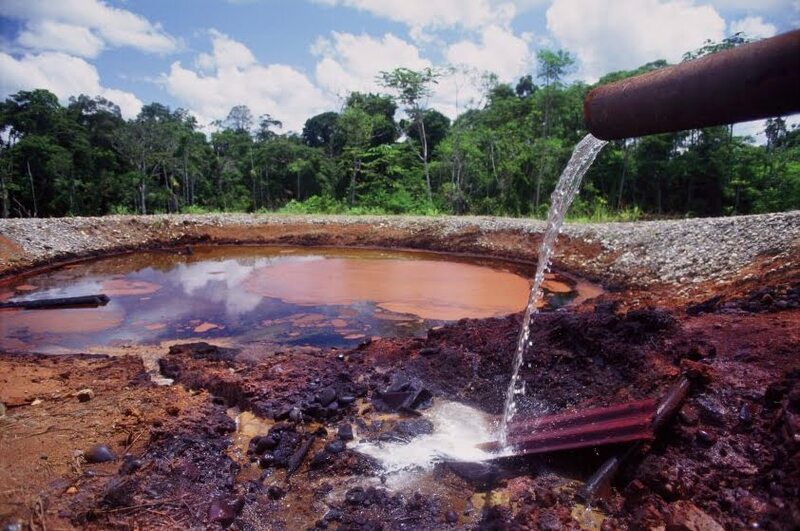 Keefe’s article describes how Donziger, a fellow of Barack Obama’s from the Harvard Law School Class of 1991, has spent the nearly two decades shuttling back and forth between Ecuador and New York, fighting a monumental court battle against Texaco/Chevron. The reason we’re hearing about this case now is quite simple: Donziger’s efforts have led to the recent court decision ordering Chevron to pay the indigenous plaintiffs $18 billion dollars. No, that is not a typo. That’s $18 billion with a b. 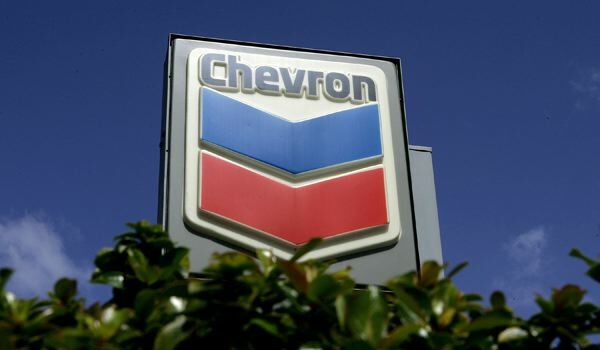 Not surprisingly, the fight has turned personal and nasty: Chevron has sued Donziger personally on civil racketeering charges, further muddying the murky waters of this gargantuan case. It’s a rather classic attempt at defamation, reminding me of the Swift boat tactics used against John Kerry’s run for the presidency in 2004. A good portion of Keefe’s article is dedicated to exploring the charges against Donziger, and questioning whether in his zeal to prosecute the environmental crimes of Chevron, he himself began gaming the system. By doing due diligence and presenting both sides of the case, The New Yorker clearly aims to placate those readers and advertisers who are more likely to be on the side of Chevron than on the side of the indigenous peoples of the Ecuadorian rainforest. But still, I’m heartened by The New Yorker‘s willingness to take the risk of angering its establishment readers and advertisers by printing a story that presents the sad tale of the destruction of the rainforest environment from the point of view of the Davids rather than the Goliaths. What’s especially sickening to contemplate is the fact that Chevron and all the other big oil corporations, despite their recent stepped-up efforts to brand themselves as “green,” are engaged in these kinds of destructive extraction practices all over the world. 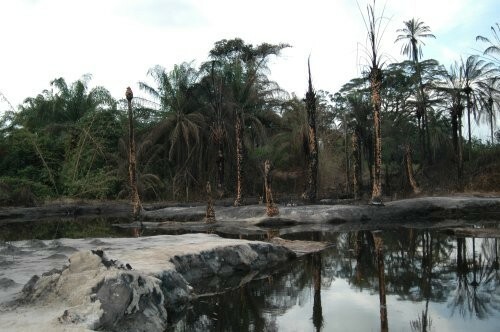 Have you seen any images from the Niger Delta recently? And next up: the boreal forest of Alberta, Canada. Let’s be honest here. Chevron is us. We have created Chevron, all of us Americans, by our wasteful, unthinking consumption of fossil fuels wrenched from the earth at horrendous cost to local–and ultimately global–ecosystems. The poisoning of watersheds and razing of forests has been going on for a long, long time–out of sight, out of mind of most of us here in the heart of empire. But now the chickens are coming home to roost. Hydro-fracking is getting so much attention because now these toxifying energy extraction methods are beginning to happen in our own backyards–that is, the backyards of the wealthy, educated readers of publications like The New Yorker and The New York Times. What can we do, now that we’re aware of the scope and gravity of these issues? Well, I am inspired by Steven Donziger’s determination to use his privileged educational background in the service of environmental justice, to hold the oil barons to account. 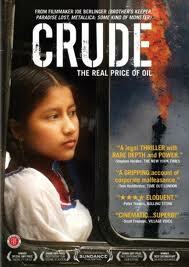 His fight, documented in the recent documentary film CRUDE: The Real Price of Oil, stands as a shining model for others coming along to emulate. For example, this year’s graduating class at Harvard Law School. I’m talking to you. This kind of nasty crap makes me think that Derrick Jensen has a point when he calls for mass sabotage. Most of the time, I think it unwise and destructive. But then, I see such as this brutal damage, and…. We have to do both. We have to reorganize our life. We have to stop wasting energy, stop buying things, and stop contributing to the GDP and the economic recovery. What does economic growth mean? More consumption of resources, more neocolonial exploitation, more ecological destruction. We also have to use all non violent means to obstruct and sabotage. I’m against arson (not even at Harris Farms cattle operation) because it destroys valuable materials and causes additional pollution, but there are subtle, technical advanced, and ecologically sound methods that I hope will be more often discussed and disseminated on Pastebin.com and other anonymous places (sorry for repeating myself, I wrote that already in a former comment). This is a great post though I don’t completely agree with the headline. please be wary of endorsing the Deep Green Resistance people. Their program is so destructive and unhinged. They keep saying that people will have to die in the resistance activism they seek to facilitate. To what end these incendiary events? To demolish Industrial Civilisation, no less. To be replaced by? Jenson says he doesn’t care, it’s the wrong question, and Keith seems to think we permaculturalists and Transition Towners will step into the breach. To me these people are frustrated celebrity-seekers and misanthropes. Please look very carefully at their site. It is extremely disturbing, but they are charismatic, and will have great appeal to our scared or dissafected youth, and loony violence-mongers. I love both your blogs BTW, and with teen girls, Jennifer, very much appreciate your dismay for your sons as we front up to these social and planetary crises. I’m wondering if we can get the teens active in the local Transition initiatives, somehow, to lend them a feeling other than powerlessness. The problem is that the teen mind is quick to resent us for wrecking the planet and economy etc, then just as quickly distracted by an ad or bit of inane teen culture. Tricky! I cannot judge if Derrick Jensen, Paul Kingsnorth, Lierre Keith are frustrated celebrity-seekers and misanthropes, because I have not met them until now and don’t know them personally. I looked at http://deepgreenresistance.org/ and was disturbed indeed, but not by the expressed views but by the cited examples of environmental crimes. I would not be pleased if electricity pylons would be blown up, leaving me in the dark (and without internet access and the possibility to respond to comments). Until now I have not found any calls or suggestions to destruct crucial infrastructure or impede vital services. Did I overlook something? If someone tries to poison me, I will fight for my life, I will try to hinder this person to deliver the poison. I consider this as self defense. We are poisoned since decades by BASF, Dow Chemical, Ineos, Exxon Mobil, DuPont, Shell, Bayer, Mitsubishi, Chevron, BP etc. The amounts of poison that reach us every day may be minuscule, but they add up. The global production of organic chemicals is around 400 million metric tons per year, the volume of chemical pulp is 130 million tons, the volume of plastic materials is 110 million tons. Global lead production is 8.6 million tons per year, mercury production is 2,000 to 3,000 tons. Total annual Dioxin and Furan (PCDD/PCDF) emissions are approximately 10,000 — 20,000 g I-TEQ. The WHO estimates, that unintentional poisonings kill an estimated 360,000 people globally each year. Toxic chemicals are emitted by industrial processes, pulp and paper plants, tanning operations, mining, and unsustainable forms of agriculture. Adult humans carry some 600 measurable chemicals in their bodies that were never in anyone’s body before the 1920s. DDT was banned in1972 but traces are found in nearly every hair sample, often exceeding WHO limits. There is evidence that DDT and other POPs increase diabetes and cancer (especially breast cancer). Everybody who thinks that the idiots who loathe and ridicule the “tree huggers” and proudly cruise around in their SUVs, big like battle tanks, the hedge fund managers and CEOs, who fly around the globe in their private jets, the billionaires who laze on their super yachts, will take their cues from the kind hearted environmentalists who try to live modestly and try to harmoniously integrate with nature, everybody who believes that our shining example alone will heal the world, has a very different life experience and a very different conception of human nature. I’m ready to change my mind about anything at anytime. Please convince me! It would be so much easier if you were right. If someone tries to poison me, I will fight for my life, I will try to hinder this person to deliver the poison. I consider this as self defense. The position of the DGR folks is that human beings collectively are poisoning the planet, which can’t fight back directly. So they are fighting for her. Although I agree with Mato that I won’t be happy if my power goes out (for any reason, from eco-terrorism to mammoth storm), it’s getting harder and harder to live with the hypocrisy of denouncing those who destroy the environment while continuing my own destructive lifestyle-as-usual. What to do? I am not sure yet. As leavergirl says, just waking up and shouting out to the world: WTF??? And WHAT NOW???? Angie and Mato, I mostly feel like you do. That the DMG people will just incite another witch hunt against people who are critical of the system. Besides, don’t we already have enough destruction? Must we add destruction by “our own”? Nah. I was just sayin’… sometimes it’s too much, and I think I know where the Jensenites are coming from. 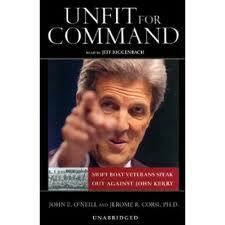 When I read their book, I was thinking, yes, they are right, something needs to be done, and soon. I hope they inspire more and more people to look at each other, and say, like Jennifer here is doing: Ok, this is past serious. So what the hell do we do? And are we ready? Hi Mato, yes I fear you missed the DGR message. They are canvassing for militants to participate in a war to bring about the rapid dismantling of industrial civilization (blowing up refineries, transmission towers, banks and so on).”This scenario would save trillions upon trillions upon trillions of living creatures. Yes, it would create hardship for the urban wealthy and poor, though most others would be better off immediately. It would be an understatement to call such a concept unpopular (although the militants in this scenario would argue that fewer people will die than in the case of runaway global warming or business as usual). They are actively recruiting and arming themselves. Asymmetric action is a euphemism for terrorist attacks. Urban people are on average three days from food riots in this scenario, and a few more to mass starvation. I cannot see how pre-emptive annihilation of children, elderly, all of us can be justified by “We’re all gonna die anyway”, but at least this way fewer wildlife species will succumb to climate chaos. That’s why I mentioned misanthropy. My family is in transition, following a close call with climate change – we almost burnt to death in a wildfire of unprecedented intensity, three years ago. We live simply, are vegetarian, pulled the kids from private schools, grow our food, and swap surplus, wear recycled clothes, collect our water and solar power, and my marriage is now fantastic, my kids fun. Sorry if I sound like a know-all or pushy etc. I’m scared of the DGR, and I’m also empowered by our lifestyle, and the community of positive, constructive people adapting to meet the challenges. Yes, what I like about the Transition Town movement is that it’s a pathway to a soft landing off of “peak oil,” and empowers people (like you and your family, Angie) to work together to build new, less destructive lives. It seems to work best in rural or small town environments, where food independence is at least theoretically possible. It’s hard to imagine how New York City, or any big city, could become a Transition Town. I was just talking with a friend about the nightmare scenario that haunts my dreams, of the “food riots” you’re talking about in the cities, leading to armed gangs moving out into the countryside and taking what they need. This could happen. I suppose that is why civil governments are training and arming the police so aggressively in crowd control. No one wants to think about this scenario, or how close we are to moving into it. I have just been rereading Margaret Atwood’s The Handmaid’s Tale, and was struck by the narrator’s description of how quickly the shift happened–one day everything “normal,” the next day the bank cards don’t work, food shortages, a militarized society. While I absolutely applaud you for what you’ve done to take charge of your family’s lifestyle, and wish I could do something similar, I am very aware that it will be next to impossible to divorce ourselves from the national and global societies we live in, should scarcity and climate-driven crises begin. I am trying in this blog to look that possibility straight in the face–which may not be much, but it’s more than almost anyone else I know is doing. And then to think about what I can do at the local level to be prepared for whatever may come. And of course, to do this thinking and preparing out loud, in conversations like this one, so that together we can strengthen and ready ourselves for the future that is already upon us in so many ways. I’m stunned! Until now I really thought, the only groups, able to actively recruit and arm themselves were the NRA, right wing fringe extremists like the anti abortion crusaders, private security companies (Academi/Xe/Blackwater, Cubic Defense Applications, Phoenix CP, AKE Group, ArmorGroup), and of course NSA/CIA/FBI, police, and the military. You are very well informed! How did you get this information? Why didn’t you inform FBI and NSA? And if you did inform the authorities how can you openly talk about your findings? If you are real this is an ongoing investigation involving hundreds of federal agents and it should be top secret! I’m not making fun here, I myself would do anything to help dismantling terror cells that are about to harm people! Until now I thought that the Patriot Act and other legislative measures that diminish civil liberties, Supreme Court rulings and inventive interpretations of existing laws (material support for terrorists) to curb freedom of speech, together with eavesdropping, data mining, sentiment analysis (VOCUS, SAS/VSTI), biometric databases, GPS tracking, the infiltration of every network with informers, indefinite detention, and extrajudicial killings via drones would keep us safe. The US Department of Homeland Security employs 200,000, the NSA about 30,000. 1,300 government organizations and 2,000 private companies work on programs related to homeland security and surveillance in more than 10,000 locations across the USA. At least 860,000 people hold top-secret security clearances, 36,000 people work for the FBI, the number of CIA jobs is estimated to be 20,000 to 30,000, not including private contractors. The US Justice Department provides 120,000 jobs. The number of employed police and sheriff’s patrol officers is 670,000, 560,000 people work in the prison system. More than two million private security officers and guards work for 12,000 security companies or directly for US corporations. How could all this hard working people fail to dismantle the DGR terror network at its very beginning? This is definitely my last post in this thread. BTW: I know http://www.transitionus.org , I visited this website many times. I’m a vegetarian (nearly vegan) and a compassionate cyclist, I live in the countryside, grow herbs, vegetables, fruits in the garden and the green house, and preferably buy the few thing that I need on farmers markets, from neighboring farms, and local businesses. I wrote about my personal transition excessively in my blog. Good points, Mato. If you read the book Deep Green Resistance, it’s made pretty clear that there’s an aboveground network, to which people like Derrick Jensen, Aric McBay and Lierre Keith belong, and an underground network, which, like any guerilla resistance movement, needs to be secretive and very careful–since of course eco-terrorism would be dealt with very harshly in the US and anywhere in the world. As you say, we don’t like people messing with our electricity! I will write about this some more, because it’s obviously a very touchy subject and I have very mixed feelings about it….. Apologies. I’m not normally given to strong language, but I was totally dismayed that this site, for which I have much respect, was giving oxygen to the DGR. I too was drawn to them, as my sympathies are strongly with the green movement, and “DEEP GREEN RESISTANCE” sounds appealing indeed. I do think you need to read through their site some more. I wish I was wrong. And good on you for your eco-conscious lifestyle. We’re trying hard to downshift, and have made a lot of changes to our consumer behaviour, but I have to admit I resist cycling (poor balance!) and love to buy wine. Ooops! (I live in Melbourne, Australia, and also have a blog in case you’re interested). I’m really relieved to read your last comment. Thanks for taking time on this. I get that New York faces hideous obstacles in terms of food security. But people are galavnising to use public and unclaimed space to run private and community gardens/ urban farms, developing rooftop and vertical gardens, and school/college gardens are exploding. Scientific American published on a project for city-based massive scale rotating produce platforms. Even if you are unable to participate personally, you can spread the word here? Should I but out now? I’m sad that well-meant info exchange seems to lead often to anger, as here with Mato. Well, this is powerful stuff we’re dealing with. And no one really knows what’s right, or best, or how to proceed. We’re all just doing our best. I appreciate your comments, Angie, and yours, Mato, and want us all to move forward constructively together. What else is a meeting space like this for? Only wish Toronto’s Star Newspaper might start doing the same… But then wait! That’s why Sun News Network was created.